If you've decided to go for something big then surely challenges are going to be a hurdle in your way. One of my reader asked me, "how can I convert my blog into a readable book?". Although he was the only reader who asked this question. But the question is really unique one. Even this thing didn't come in my mind also that I can save my blog as a professionally printed book. Now you might be thinking that I can easily do this by saving my all blog posts into a word-pad file and then printing them with colorful printer. Further I just need to add book cover and that's it, my printed blog book is ready. Ohk let's make it straight, can you print last 10 years blog posts into a book? no you can't. It would be a lengthy and time consuming process. Don't worry there's a much simpler way for this. There are some online services which can produce a book with some clicks only. We've covered them below according to their popularity and quality they are providing. Using them you can create book from blog. It's the best online website for converting your blog posts into a printed readable book. 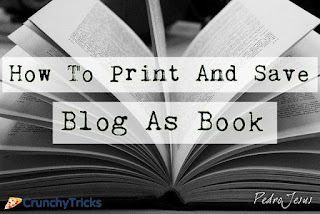 Blog 2 Print allows you to design your book with a couple of clicks. Just choose your front cover, back cover and the posts you would like to include in your book. Currently they can produce book from blogger, Wordpress (hosted, self-hosted), typepad and tumblr. Navigate to their website. At the home page you will see a option to enter your blog's web address. Enter according to the blog platform you're using. 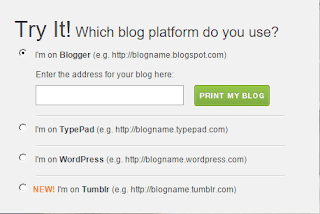 Enter your blog URL and hit Print My Blog button. 1. You have two options for blog posts either include all or choose within a specific range of date. 2. Blog 2 print two options for blog's template you can either make it compact (makes the best use of space) or snapshot (keep content as it is). 3. One can easily customize page breaks and photo size too. 4. This service include all the possible customization tools for a cover such as you can choose Design choices (Solid-black, typeset, pink leaves, navy stripes and many more), book title, side text, front cover, back cover. 5. Some people prefer to mention dedication (dedicated to) text which would appear at the starting of book. You can customize it easily with blog 2 print. Once your book is ready simply press create my book. On the next page you can have a preview of your blog. Their plan starts from $7.95 and can have maximum up to $58.67. I have mentioned two more similar websites to try. So this was all about printing blog into a awesome looking book. Give them a try and share your experience with us. For any doubt or query leave a comment below in the comment section.